Ok, I admit the photo does not do it justice. I'm not photographer, obviously! 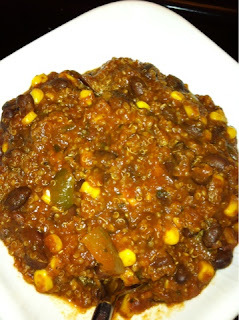 Pantry Chili? Yep, that's when you scrounge through your pantry and pull out whatever you have that may work as chili. This year I have used my crock pot TWICE! I've owned the darn thing for like 10 years and have probably before this year used it about 10 times. Any who, enough about my aversion to slow cookers. Ingredient suggestions, substitute with what you have on hand if need be! 2 cans Beans, drained. I used black beans this time. Directions: Put all ingredients above into crock pot. Set on low and let cook for 6 hours. Do not be tempted to add more quinoa, a little turns into a lot when it fluffs up! This chili will also be good with any type of frozen veggies you have. Make a fresh loaf of bread in your breadmachine and dinner for 2 nights is DONE!